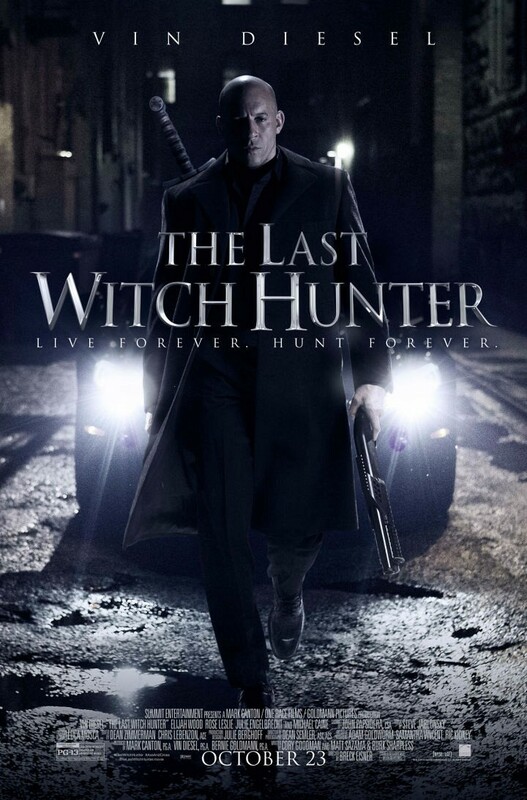 The last witch hunter (Vin Diesel) is all that stands between humanity and the combined forces of the most horrifying witches in history. I really wanted to like this. This had the perfect ingredients for a guilty pleasure. BUT all it did was leave me screaming like one of the tortured witches. The opening was ridiculous. Come on, Vin Diesel with hair? Farfetched already. BUT it was watchable enough as Vin’s Kaulder and his band of miserable medieval men stake out a coven. Despite the frenetic violent sequence, it was too dark and disorienting to see who was doing what. I lost track of who was killing who? Heavy censorship to keep the 12A rating? Maybe. It wasn’t long before our hero was cursed in the dying breath of a bizarre looking witch. Cursed with immortality. Flash forward to the present with ol’ baldy. Not sure what accent Diesel was trying to pull off BUT either way you couldn’t tell because he was so inaudible. His gruffest yet. He was far too serious for his own good. Laughable for all the wrong reasons. Michael Caine’s priest was one of the better characters and he was barely in it! He quickly set up the back story about the truce between the witches and humans, cracked a couple of one liners and then sat this one out. His presence was sorely missed. Shame considering how well he worked with Diesel. They would have been a great duo and Vin seemed to lighten up with the old chap. Instead we had Elijah Wood. Now, don’t get me wrong. I would have banked on Frodo to deliver the goods BUT his squeaky clean priest was too weak and annoying. BUT he didn’t come quite as close to irritating me as much as Rose Leslie (Game of Thrones) did. She tried to provide a much needed comic relief as Chloe the witch barmaid roped into Diesel’s chaotic world. BUT her voice grated against me and frankly did my nut in. I kept expecting her to say, “You know nothhhinggg”. Julie Engelbrecht’s appropriately titled baddie Witch Queen was terrible. She may have looked the part with her messed up make up BUT she was far too bland and unmemorable to make a real impression. I really hoped that this would have been like Constantine. That perfect balance of dark and crazy. BUT for the majority of the piece, I was bored. The pace dipped in and out. The story was weak. And even when the action kicked in, I had already lost interest. That’s NOT to say it didn’t have its moments. BUT there weren’t a lot. A scene in which Diesel must get information from a witch at a fashion show allowed for a demented encounter in which the mirrors showed the models’ true reflections. I wanted more of that. BUT even then the CGI tested Van Helsing levels. Incredible in one shot, cartoony and naff the next. There was a revelation 75 minutes into the movie which made the last 30 minutes a little more bearable. Wood and Diesel’s partnership only got going in the final act. BUT even then the corny exchanges were too much. It was too generic, predictable, cliched and dull. NOT Diesel’s worst BUT it wasn’t far off. I’m digging through my old DVDs for Constantine to erase the memory of this mess.